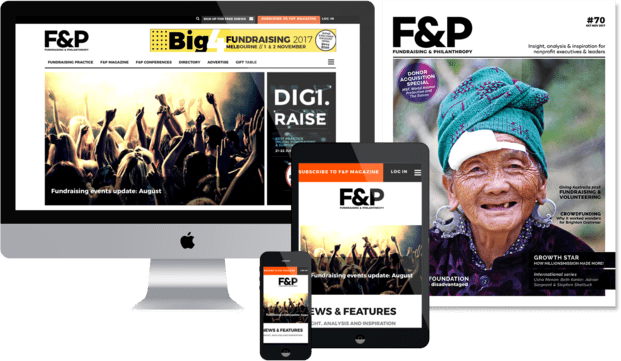 Stories and articles are sourced from a wide variety of experts including our in-house journalists and leading nonprofit executives, practitioners, specialists and academics. This ensures you receive the most incisive perspectives on the issues and events of today, and the ideas and technology of tomorrow. Specialist areas covered include fundraising practice, marketing, tax, legislation, technology, philanthropy, management and leadership. During his time in nonprofit fundraising and marketing, Jeremy worked with the Royal Institute for Deaf and Blind Children, YWCA NSW and as a consultant with DVA Navion. He founded Fundraising & Philanthropy and its parent company Bombora Publishing in 2004, and continues to oversee the magazine and its related annual conferences and courses. Andrew Sadauskas is a Sydney-based journalist with more than five years’ experience across both print and online publications. Before joining the team, Andrew was a reporter at leading tech news publications iTnews and BIT. He has also written for a number of leading business news publications, including SmartCompany and StartupSmart, and has spent three years volunteering at a community radio station. Follow him on Twitter at @AndrewSadauskas. Tatyana has worked across a variety of industries where her sales and sponsorship skills have helped find innovative ways to resolve needs and promote brands. Her experience in marketing solutions enables her to work closely with clients to develop tailored partnerships that include branding, content and sponsorship. When Ruth came to Australia on a six-month working holiday from the UK, she met a tall, dark handsome vet in the ski fields of Thredbo and that was the start of her Australian odyssey. Her career path began in the UK in the tourism/hospitality sector and has encompassedmanaging a ski lodge, heading up convention bureaux in Newcastle and the Hunter Valley, and managing conferences for upto 1,000 delegates. Her passion for the performing arts led her to a five-year sojourn in the arts industry managing a symphony orchestra and working for the Australian Bicentennial Authority. Today this same passion finds her singing in choirs and enjoying classical concerts. She has been married to the vet for 35 years and they are currently parents to one ‘fur baby’. Natasha is an internationally experienced graphic designer with a solid working knowledge of the elements that combine to produce exceptional visual solutions. Her creative skills have been honed through various roles, including at a boutique Sydney design studio, a Singapore-based luxury lifestyle magazine and, most recently, a Hunter Valley-based wedding magazine. She values ideas, imagination, intelligence and integrity, and envisions a world free of bad typography, questionable kerning and requests to ‘make the logo bigger’. She is a dedicated exerciser, voracious reader, frustrated writer, wannabe domestic goddess and lover of the beautiful and slightly off-beat. Anne has many years of administration experience, firstly in the insurance, real estate and technology fields and then for over 20 years in the nonprofit sector. She has been involved in organising many fundraising events as well as coordinating and supporting fundraising volunteers. Her background in the sector has given Anne the tools to understand what nonprofits are all about. She works across all aspects of the organisation and is always happy to assist with enquiries about subscriptions, invoices, conferences etc. Anne is the mother of three beautiful, grown-up children who are all very slow to give her grandchildren. She knits and crochets in hope! Judy’s professional life in fundraising has taken her from the arts to health, from higher education to refugee law. At the Jewish Museum of Australia she was a one stop shop, including running appeals, corporate partnerships, major giving and managing two capital campaigns. At The Australian Ballet she led the Annual Giving Team and at the University of Melbourne she brought in significant sponsorship and philanthropy for the new Melbourne School of Design. Finally, for the Melbourne Symphony Orchestra, she was able to contribute to all aspects of an integrated program, with a focus on major giving. Judy was a key volunteer for Amnesty International through the 1980s and 90s, raising funds through merchandise, appeals and events, and sitting on state and national committees. Now splitting her time between creative writing and her own consultancy, Judy is delighted to be curating the programs for F&P conferences. Carl is the Fundraising Director at the Peter MacCallum Cancer Foundation and has close to two decades of senior fundraising experience at some of Australia’s leading charities. Carl has extensive expertise across the key fundraising methodologies and is passionate in establishing effective business rules and processes to empower staff in strategic donor engagement. This has resulted in several awards for fundraising excellence. David’s fundraising career spans 15 years and several senior executive roles. He is currently Head of Engagement and Sustainability at Caritas Australia. His more recent roles include Head of Fundraising at Australian Red Cross and, prior to that, Fundraising Manager at Amnesty International Australia. Christopher has built knowledge of private giving for public good as an academic with an impressive list of international publications to his name. A Research Fellow who helps teach the Masters program at the Asia-Pacific Centre for Social Investment and Philanthropy (part of the Centre for Social Impact at Swinburne University of Technology), he is best known for his landmark studies on charitable giving by Australians from personal estates. Jenny has over 20 years’ experience building global brands across Europe, Australia and New Zealand. After joining WWF Australia in 2007, where she is now Fundraising Director, she and her teams have successfully innovated to reach new audiences, improve supporter loyalty, and grow major and regular giving, helping to more than double the charity’s income to over $20 million over a three-year period. Laura has worked in fundraising at Oxfam in the UK and New Zealand, and more recently as Fundraising Director at Greenpeace New Zealand, where she led developments using a combination of crowdfunding, TV, SMS and phone to sign up regular givers. Still based in New Zealand, she is now a Global Fundraising Specialist at Oxfam International, focusing on supporter retention and development. For 25 years, Susanne has held senior marketing and fundraising positions at charities including the Heart Foundation, the Arts Centre Melbourne and Monash University. A winner of multiple awards for her work in the nonprofit and commercial sectors, she is now Head of Fundraising at the Walter and Eliza Hall Institute of Medical Research. She has taken an active role in developing fundraisers for Fundraising Institute Australia.